When I tasted my first brownie back in the early 1990s (shock horror), I thought I’d died and gone to heaven. It was pure bliss. I had no idea at the time that they would become one of my staple bakes and that I would make so many variations. 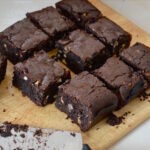 A quick check has just shown me that I’ve over 40 different brownie recipes on this blog alone. I blame an American friend for this fixation and Gina’s fudge brownies was the only recipe I used for many years. Then I started writing a chocolate blog and there was no stopping me. Brownies are one of the simplest bakes out there and a great thing to make when you need a quick sweet chocolate fix. These days I write less about chocolate indulgence and more about my healthier recipes, but sometimes you just have to let go. Triple chocolate might be overstating the case slightly. There’s plenty of dark chocolate and white chocolate, but only a smidgen of cocoa powder for an extra bit of dark richness. Despite the inclusion of white chocolate, these triple chocolate almond brownies are a bit more sophisticated than most. They aren’t quite as sweet as your average brownie and the salty bite identifies them as adult fare. But fudgy and delicious they certainly are. The bits of white chocolate caramelise whilst cooking making them even more toothsome. Who needs loads of washing up at the end of an indulgent baking session? Not me. I developed my one pan brownie method early on in my brownie making career. Admittedly, a second one comes in handy to bake the brownies in, but other than that all that’s needed is a saucepan and a wooden spoon. The key to making these some of the best brownies I’ve ever eaten is grinding whole almonds just before they go into the mix. This not only allows the nuts to announce their freshness, but it gives an improved texture to the bake too. It’s almost impossible to finely grind every bit of almond, even if you do use my super duper Optimum Vac2 Air Vacuum Blender – which I did. The advantage of using whole almonds rather than blanched is that you get the additional benefit of eating the skins. I like to use duck eggs for baking when I can get them and I’m vastly relieved to have found a good source in my new New Forest home. So it was duck eggs rather than hens that went into these triple chocolate almond brownies. Dark chocolate, white chocolate, cocoa powder and salted butter combine to make a surprisingly sophisticated fudgy and delicious brownie. Made with ground almonds, they are naturally gluten-free. In a large pan melt the butter and dark chocolate over a gentle heat. As soon as the chocolate has melted, remove from the heat and stir in the sugar until everything's well combined. Beat in the vanilla extract and eggs, one at a time, followed by the cocoa powder. Stir in the baking powder and ground almonds. I used my fab Optimum Vac2 Air Vacuum Blender to grind the almonds. Finally, stir in the white chocolate pieces. Pour into a 20cm sq silicone mould or lined cake tin and bake in a preheated oven at 170C for about 35 minutes. Baking time will vary depending on your oven, but you're looking for a well risen crusty top that still has a bit of a wobble when shaken. You won't get fudgy brownies if you over bake, but you don't want liquid ones either. They will firm up a little when cooled. Leave in the tin to cool completely before cutting into 12 pieces. Grinding whole almonds generally gives a better texture and flavour than using ready ground almonds. Will keep in an air-tight tin for five days, though they are at their best on day two. These triple chocolate almond brownies are my contribution to this month’s #WeShould Cocoa. I’m also sharing them with #BakingCrumbs which is usually hosted over at Only Crumbs Remain, but is with Jo’s Kitchen Larder for May. Bake of the Week with Mummy Mishaps. Love Cake with JibberJabberUK. Free From Fridays with Le Coin de Mel. And the new linky #G2BGF with Gluten Free Alchemist. Thanks for visiting Tin and Thyme. If you make these naturally gluten-free triple chocolate almond brownies, I’d love to hear about it in the comments below or via social media. Do share photos on your preferred social media site and use the hashtag #tinandthyme, so I can spot them. For more delicious and nutritious recipes, follow me on Twitter, Facebook, Instagram or Pinterest. Triple Chocolate Almond Brownies. PIN IT. These sound amazing! They look so good, dark and chocolatey too. They are some of the best I’ve made. I say that with caution, because I always think my latest brownies are the best. 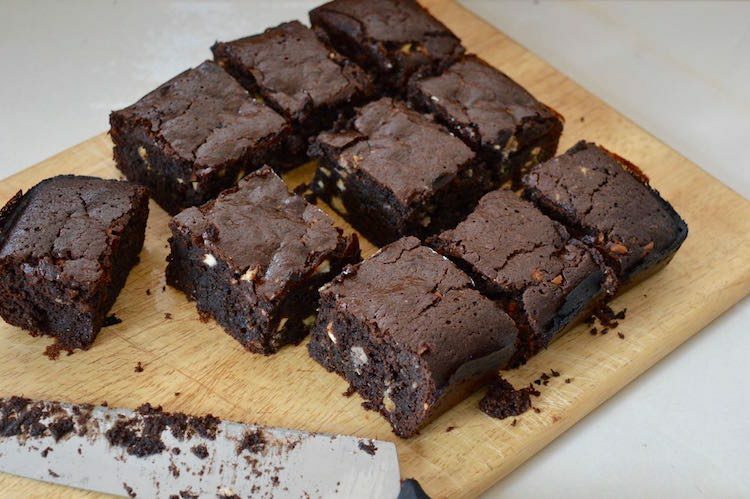 Wow these look so good that I am now mentally rifling through my pantry and I think I have it all – E told me did not like the whole almond chocolate I bought recently and I am thinking it could be chopped up for these brownies. Good reminder to put my WSC entry this month. I have a chocolate cake to post tomorrow but will probably miss the deadline for this month anyway so hope to put it in next month. Almond chocolate is CT’s favourite. Perhaps you could send it his way 😀 I won’t be doing the #WeShouldCocoa round-up until the 1st, so you can always message me your link if you post before then. Brownies are so addictive..that’s why I don’t bake them as often as I want to..yours with almonds and duck eggs look so darn good! Thanks Emma. Ground almonds can be brilliant for baking and they have that added bonus of being gluten-free. These looks so good! I’m on the search for gluten free recipes for a pop-up cake stall I’m doing at the end of May so these could be just the thing! These are the sort of things that would fly at a pop-up cake stall Ness. Go for it. I love using salted butter in desserts! And I agree that grinding your own almonds is so much better than using shop bought ones (especially if you’be got a blender that can do this well, such as the Optimum blender!). The brownies look fabulous! Thanks Monika. I’ve been grinding my own almonds for years now and only use the ready ground ones when I need something extra fine. Oh wow Choclette, they look incredibly fudgy, moreish and quite simply perfect! I also love brownies and I’ve also been making them since the early 1990s. Simplest yet most delicious bake, especially with a scoop of vanilla ice cream 🙂 I love bakes using ground almonds in place of flour: they’re dense, have a perfect texture and a slight note of almond. Pure deliciousness! Thanks for joining in with #FreeFromFridays. Thanks Mel. I agree, ground almonds work brilliantly in so many bakes. Reading your comment has made me incredibly hungry and now I really feel like I need a brownie. Thanks Jenny, I agree, warm with ice cream is an excellent way to go. Oh my oh my. These look great! Gotta try making these! Thanks Poyma. I shall be making them again soon for sure. They are so good. Those look totally luscious! I haven’t baked brownies for ages….. time to rectify that!! I go for ages without baking or having a brownie, then suddenly, nothing else will do. I am actually drooling reading this recipe. They look so rich and I actually prefer brownies made with nuts rather than flour. They are so good made with ground almonds Claire. Mind you, your Minister’s Slices are delicious too – I’ve just made some. I couldn’t quite believe it was 40 until I added them all up. I think I might have a thing about brownies 😉 Grinding the nuts yourself really does make a difference. I think you’ve read my mind! I’ve been dreaming about brownies all day and now I’m going to have to make them. Oops, thanks for letting me know about that Kath. I’d better sort that out right now. And so glad you’re making them too. They are delicious. Ah, but you can’t go wrong with brownies. They are such a crowd pleaser. Thanks Amanda. Hugely appeals to me too. I spend far to much time washing up. What gorgeous looking brownies, you can’t beat a squidgy brownie! I’m never quite sure which is my favourite, brownie or tiffin. Such a dilemma. Oh….. My….. Goodness! These are absolutely amazing Choclette. They look so very tempting that I want to eat my computer….. Which would be a very bad idea….. but if it would just bring me that little bit closer to tasting these delicious brownies, then it is worth a try…… Or maybe I could just try making them?! I am pleased to hear that you have found a good source for duck eggs at your new home…… We are very lucky to have a local supply too, for which I am very grateful. No, no, don’t go eating your computer Kate. It really wouldn’t taste very nice at all. Hmm, yes, brownies are one of my nemesis. I can’t resist a good one. My supply of duck eggs ( occasional turkey eggs), is a bit erratic, but I’d rather have that than nothing. They look like a Brownie should look like, Ijust want to reach in and take a bite. Haha, feel free to tuck in Jacqui, but I warn you, one bite won’t be enough. I made these! They were lovely and rich and they are gone now. I used the darkest chocolate and unfortunately some of the white chocolate was Lindt and melted clean away but the regular white was there to bIte on. I cut it in SMALL pieces because it was so rich. This will certainly be made again. It also kept in a tin for a few days and was still lovely and moist. Thankyou for a luscious recipe. So glad you liked them Mary and thanks for letting me know. I’ve never used lindt white chocolate in baking before, it’s good to know NOT to use it if you want chunks.